The denturist profession is pro-denture wearer, not anti-dentistry. Denturists are an educated part of the dental team and learn their trade under highly qualified education guidelines. Before obtaining licensure they must pass an examination specific to the profession. Dentures can hide evidence of oral pathology. An annual examination of the oral tissues by a Denturist is highly recommended. As a person ages the mouth gets smaller, resulting in loosening of dentures. Prolonged use of drug store type adhesives may lead to stomach pains because they mix with your saliva and are swallowed. 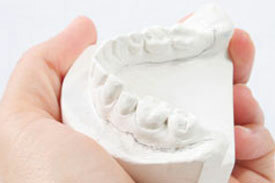 Myth: Dentures last forever… Wrong! Dentures are durable but they aren’t any more permanent than eyeglasses. Just as the condition of your eyes change as you age, so do the conditions of your mouth. Replacing dentures every five to ten years will ensure that you maintain a healthy smile and prevent intraoral deterioration. Myth: Once you have dentures, you don’t need to see a denturist anymore… Wrong Again! Myth: Everyone knows when you’re wearing dentures. It’s embarrassing… Not True! Regular professional examinations and following your denturist’s instructions on home care are essential steps in assuring a “natural appearance.” Confidence in wearing dentures comes from realizing that you have taken a positive step towards improving your health and appearance. Myth: Denture wearers can’t eat normally, or even speak properly… Incorrect! Myth: I have to use adhesives to make my dentures fit, or I can’t wear them all day… Nope! Myth: Dentures are not affected by over-the-counter and prescription medications… False! Drugs can affect denture fit and wearability. For example, certain medications can reduce the amount of saliva in your mouth, making it difficult to swallow or chew. So let your denturist know of any medications you may be taking regularly, or even occasionally. Myth: I can make my own denture repairs… Bad Idea! Even if you are great at fixing leaky pipes or automobiles, do not try to adjust or repair your dentures yourself. Improperly relined dentures can be bulky, causing increased pressure on the jaw and more rapid loss of jawbone. Myth: I’ll be without teeth for days if I take my denture to the denturist for refitting or repair… Wrong! Myth: I don’t want to go through a long adjustment period again… You Won’t! The first time is always the hardest to adjust to. You’ve learned the basics about eating, speaking and wearing a denture. There will be some adjustment, but it will probably be shorter and easier than the first time. Prolonged use of ill-fitting dentures can irritate the gums, tongue and cheek, and even cause the ridges of your mouth to shrink to the point where it will almost be impossible to fit you with normal dentures. Myth: All dentures are the same… Not even close! When your dentures are made by a denturist, you are in the hands of a person who specializes only in the making of dentures. All phases of the service are performed by the same operator, resulting in an accurate and personalized denture product.